I recently picked up a Buell Blast cheap ($250.00). Unlike other cheap bikes I have acquired in the past, this one runs well and doesn't leak or burn oil. The signals (and other things) were removed by the PO. I am considering one of the LED headlights with signals that I have seen on ebay. Do any of you have experience with these? Would be grateful for any thoughts, including brand and sources. Personally, I would not use one because those things have the indicators too close together to either be legal....or safe IMO. Get a headlight and some indicators as separate items. Generic indicators are a few bucks each from eBay. I think if you ask any really old biker that question the response will be the same, integrating turn signals within the headlight or taillight seems like a great way to increase your chances of being run over. I was dancing across the lake in my boat last year, doing about 70mph. I could see something black in the water and went over thinking it might be a dead head log. When I got there I realized it was a guy swimming, by himself, in the middle of dark water. I said to him "you shouldn't be out here without a pace boat, you are hard to see and someone could hit you" he replied "I have the right-of-way". "I have the right of way" LOL, I should have run him over because he is too stupid to be allowed to breed. If someone doesn't see your signals, because they are tiny and not located where they would be expected, and hits you. Are you going to say to the surgeon "I had the right-of-way"? What happened to the lights the PO took off? I have a mixed mind about this...for the most part most of the ones I see in the aftermarket don't have good visibility. These are usually the single row LED inside the headlight glass. think about it, you are asking someone to stare into the brightest part of your motorcycle to see a strip of about 6-7 LED yellow lights - it's not a good fit, if you look at modern cars with a combined LED and headlight combo - they shut off that headlight when the signal is activated. Plus there is no side visibility for the blinker which is really what you want. I watched him ride away and you could see his signals no problem, but with the bike off you would be hard pressed to spot them. I went through something similar with my bmw this year - PO had taken off the old signals, and I ended up just buying some off the shelf LED ones that I thought would be visible enough. Now that they are mounted and working I am having second thoughts and might add some more lights just because I don't think they are visible enough. Last edited by Geeto67; 03-28-2019 at 08:04 AM. If I'm riding at night there is no street lighting so I like to have signals set wider than me and hope they don't want to go into the light. Another reason why this planet is so fucked..... natural selection just ain't what it used to be. Had to rescue the same guy on two separate occasions. First time was at night, two boats collided and he went through the windshield..boat sank...one of his buddies drowned. Couple of years later the same guy drifts by with the boat taking on water and engines are submerged because they didn't properly plug an unused through hull for the crapper. Should have pretended I didn't see him. 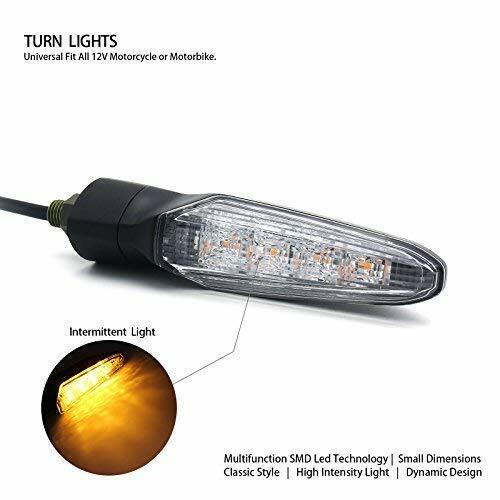 Really nice quality, bright, regular LED turn signals are neither ugly nor expensive. Should have taken him a rock.